Our climbing French beans were such a hit last year, that we were definitely keen to sow them again. They were relatively easy to grow, looked great, tasted great and were even better with the recipe we found for preserving them. What more could you ask for? More beans, of course! We decided to stick with exactly what we did last year – Suttons’ colourful climbing mix. Apparently, 2018 is the year of the chilli. When we went to Glee, the trade show of the garden industry, last September, several companies were featuring them. Here’s part of the Thompson & Morgan display at Glee which has what we thought was a well-designed heat indicator. We thought we would take the opportunity to do our own mini trial of a few varieties of chilli to see how they perform. We were finally able to make it down to the greenhouse on the Easter weekend. But have our new tubers survived the long wait to be planted? Major works at home kept us occupied for most of March. Not only that, snow and freezing temperatures made visiting the plot or the greenhouse even for a short while impossible. As a wheelchair user, Andrew can’t move around as readily as most of us, which means that his body temperature drops fast – something he’s not always aware of until it’s too late, which can make him very unwell. And so the plants and tubers we ordered have had to wait – some survived better than others. This page may contain affiliate links – thank you for your support of our Quest for Veg! It looks like we’ve been visited by damping off disease. We found this little zinnia seedling flopped over, and going brown from the base of the stem upwards. 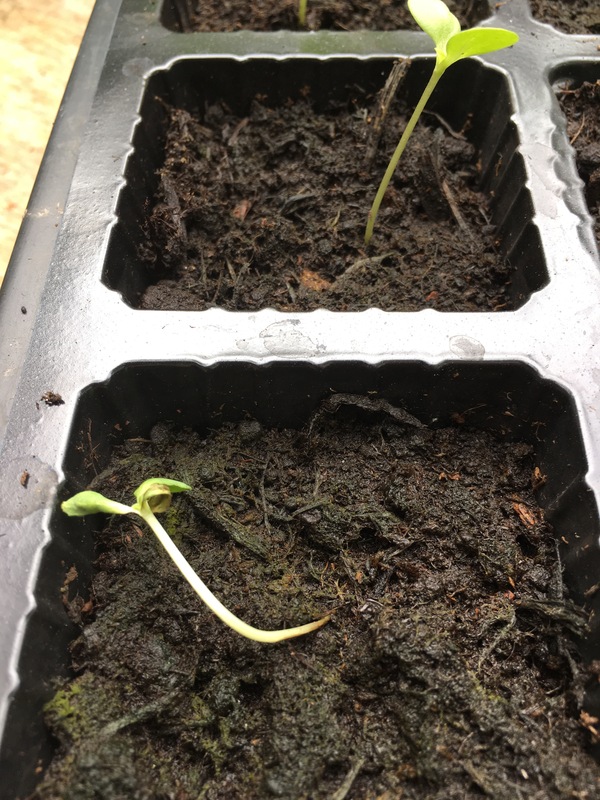 It looks as though we have been lucky in that we only seem to have lost three zinnia seedlings to date. It can wipe out a patch of seedlings in a tray or spread to the whole tray or beyond. Damping off is caused by several types of organism, particularly certain types of fungi and bacteria. They live in the soil and are usually carried by water. We all like to be asked our opinion, right? So, when Westland got in touch and asked if we’d be interesting in trialling and reviewing some of their products, of course we said yes. As a start, they sent us some seeds from their Bursting with Flavour range. I think that here at Quest for Veg we can safely be described as food enthusiasts! We’ll sow the carrots and beetroot as soon as we get the beds prepared. 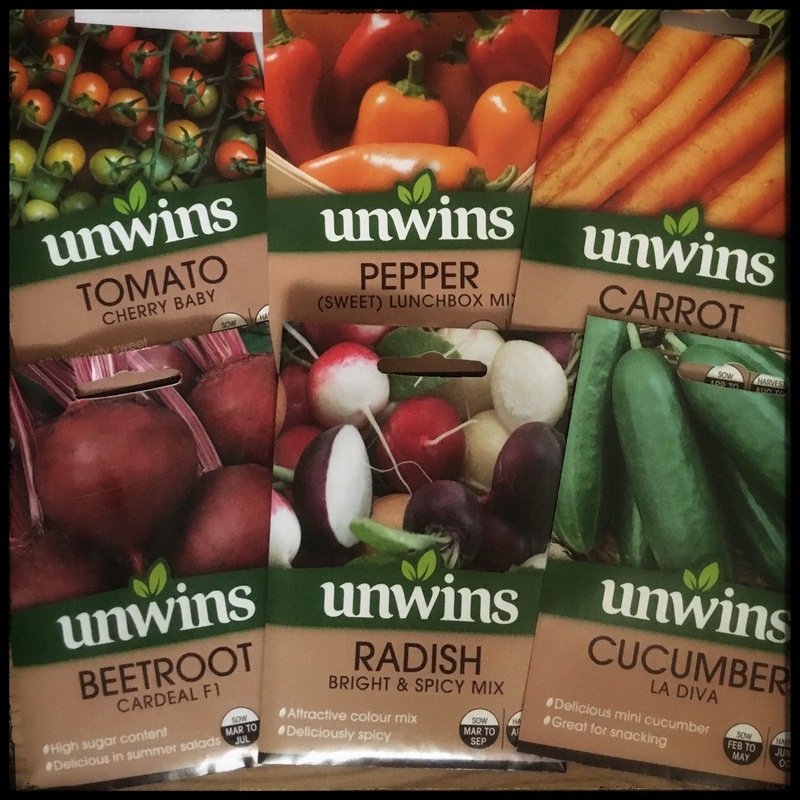 One thing that did strike us was that for the ones we sowed in the greenhouse: there were not many seeds in each packet. The average packet contents for the peppers is just six, and the tomatoes and cucumbers ten in each. At £2.99 per pack, I think if we were buying these in the garden centre, we’d probably choose a variety with more seeds in the packet – we do like to feel we’re getting our money’s worth! But if space is at a premium, or you’re looking for something promising more flavour, why not give these a try? I am happy to report that we will probably not go short of beetroot (200 per pack), radish (400 per pack) or carrots (500 per pack). It’s the middle of April and we have a full house – the greenhouse is bursting at the seams! We’re aiming to bring on a succession of seedlings over a range of plants and we’re not quite ready to start hardening things off. Not only that, Andrew won some zinnia seeds from Mr Fothergill and couldn’t resist sowing them. We have no idea where we’re going to plant them but their rosy purple flowers should look amazing. You may get the impression from this video tour that Sandra is not a huge fan of marrows. Can you convert her? If you have any recipe suggestions, please let us know! In this video, Andrew demonstrates how to handle seedlings during pricking out. Aim to prick out seedlings as soon as you can get hold of a seed leaf (called a cotyledon). That is the only part of the seedling you should handle. This is because the cotyledons are very hardy. Other parts of the seedling can be damaged easily which may at best put the plant under stress, and at worst damage or even kill the seedling. Choose a container that is going to be big enough to allow them to grow to the size you want for planting out into their final position. We used a range of cells trays and pots depending on the size the plant is likely to grow to – pumpkins went in larger pots than alpine strawberries! The compost used for pricking out can be potting or universal /multi purpose compost. We use peat free. When you have potted up your seedlings, give them a good watering, and water regularly. When the plant shows signs of growth, such as developing more leaves, you should consider adding a fertiliser to encourage root growth. 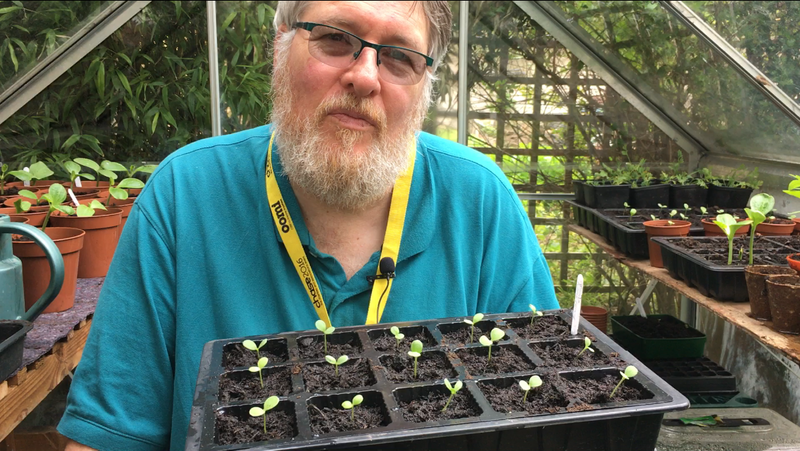 The seedlings shown in the video are Zinnia Purple Prince that Andrew won from Mr Fothergill. We’ve got a lot further in our Quest for Veg than we had dared to hope. This is mainly due to the terrific amount of help we’ve received from our very good friends Richard Anderson (Anderson Landscapes), and Elisa Contreras and Rodney Williams (The Secret Garden). 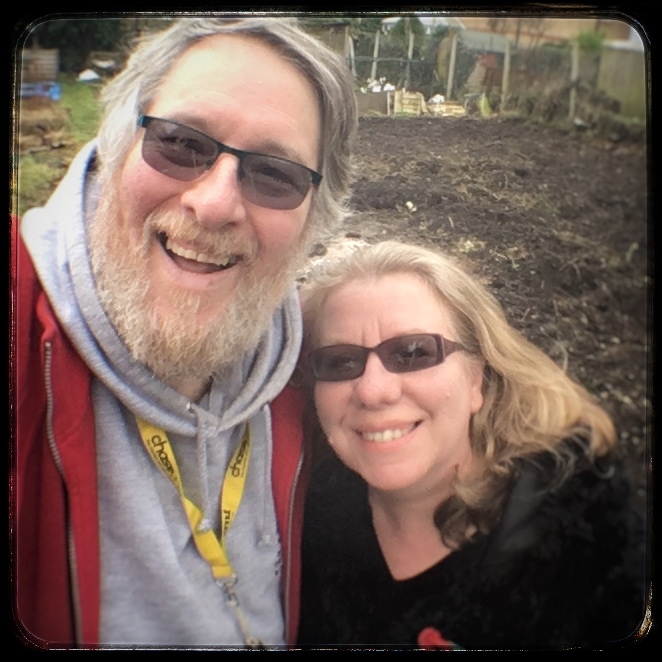 When we started, I think we anticipated that our first year would probably be spent getting the allotment into shape. And yet here we are, just entering April, and we are looking forward to sowing our first seeds on the plot. Not only that but during March, Richard very kindly gave us the use of his greenhouse. This enabled Sandra to sow her first seeds. We decided to try to create some woodchip paths to help define the plot and give us some relatively mud free areas to work on. By chance, Andrew came across a Garden Inspirations of Cheam who were working on a tree across the road from where we live. 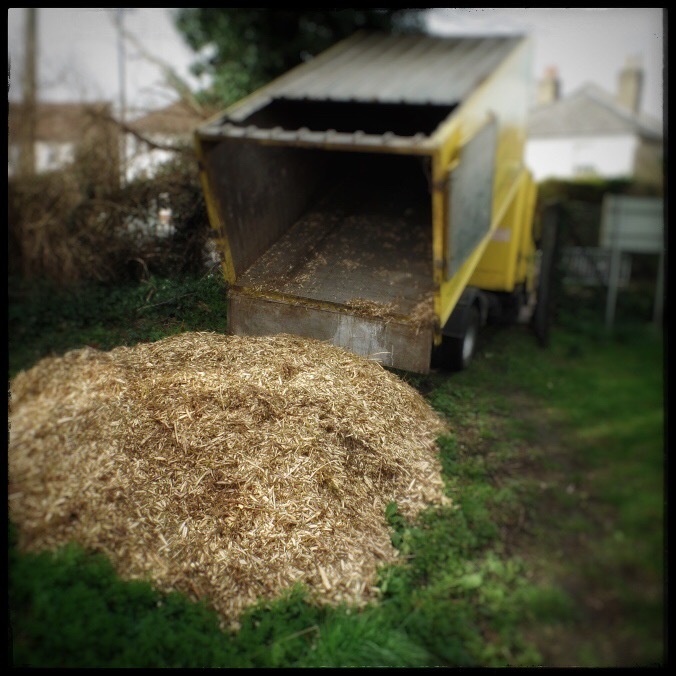 They enthusiastically agreed to deliver the woodchip straight to the plot. We found a little garden cart by Draper which we could attach to Andrew’s mobility scooter. 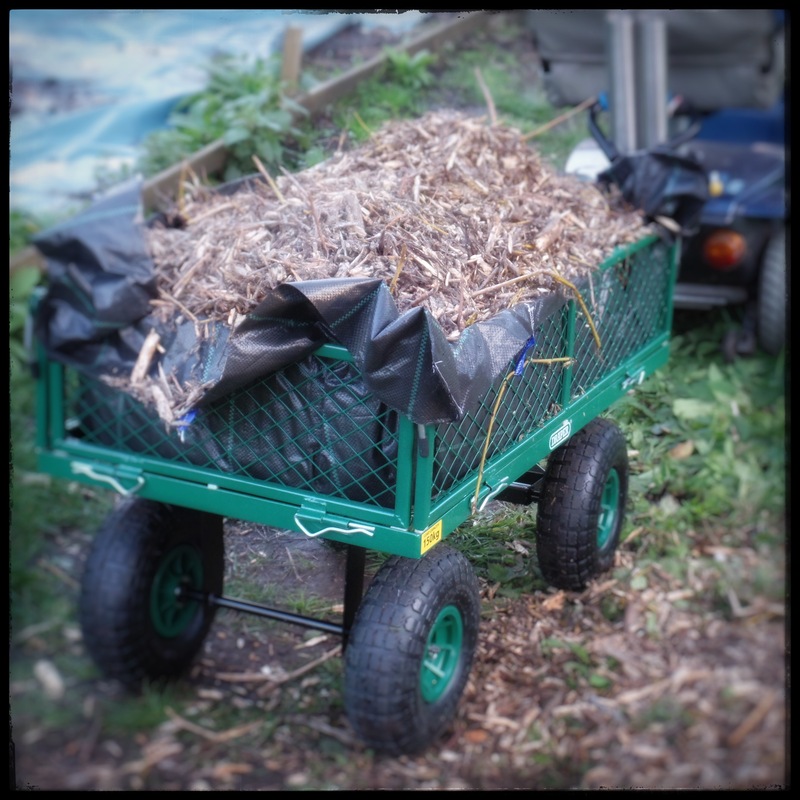 It’s perfect for transporting tools and equipment to and from the allotment. Andrew made a liner so that we could also use it for moving the woodchip from the gate to our plot. 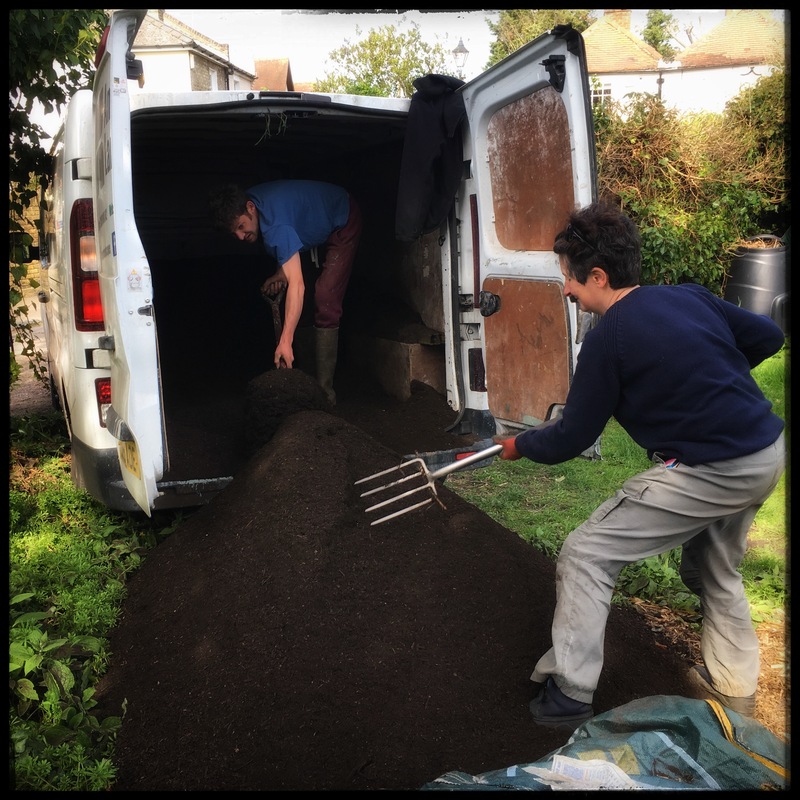 Richard also came up with some compost that was surplus to requirements. He brought it to the site, and he and Elisa moved it to the plot. We used it to add to the raised bed we made using builder’s bags. We bought some weed suppressing membrane and covered most of the plot to, er, suppress the weeds. 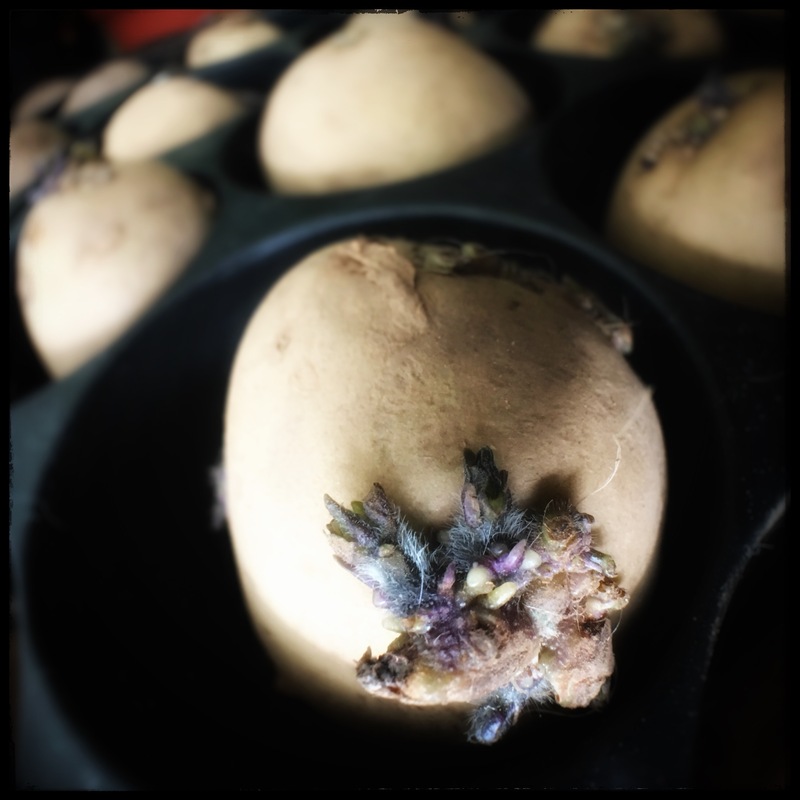 And we’re chitting some potatoes which are now ready for planting out. We should be planting out our potatoes very soon. 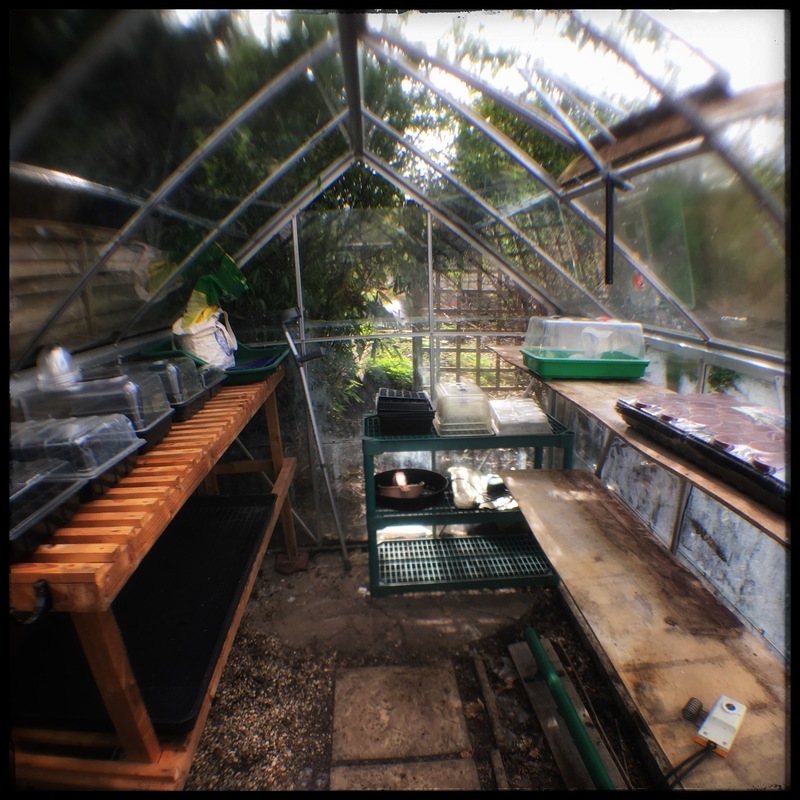 We’ll also be direct sowing some seeds and transplanting some seedlings that have been started in the greenhouse. Hopefully, we’ll also be putting a water tank on the site soon and deciding on what shed we want. Roll on April! 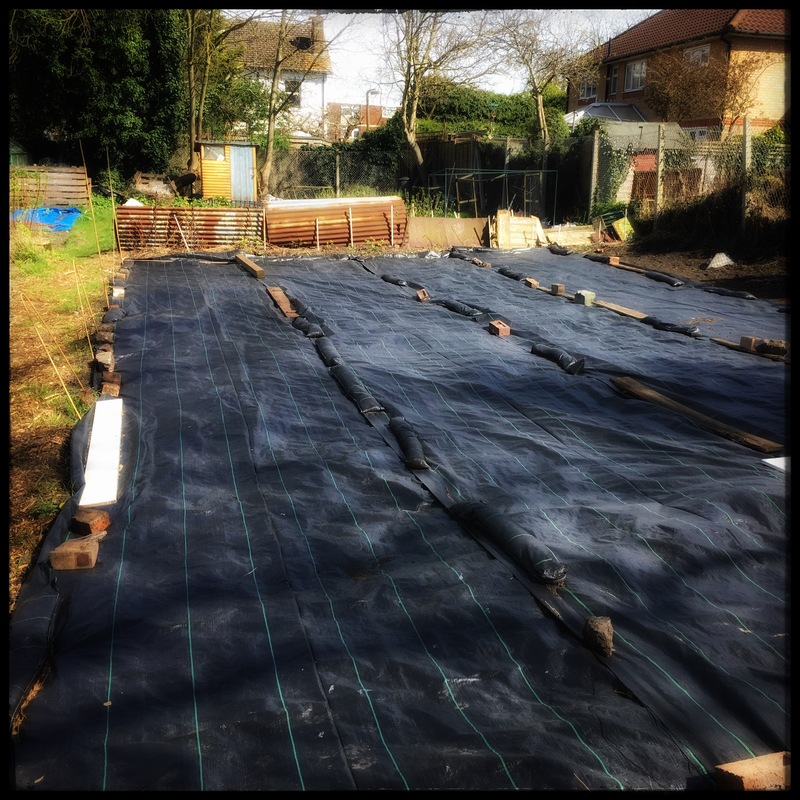 It’s been a week since we sowed our first seeds in the greenhouse that our good friend Richard is kindly lending us. It might be early days but so far there are no signs of life. We had a basic thermometer in the greenhouse and, even though the greenhouse has a tube heater, we were worried that the temperature was dropping in the evenings and at night below what we needed to germinate our seeds. On average, plants need a temperature of around 15-20 degrees centigrade to germinate, although some plants may have particular temperature requirements outside this range. Andrew decided that we needed to raise the temperature under the seeds, so we went in search of a basic propagator. We didn’t want to spend too much money so went to a DIY store rather than a garden centre where we have found prices tend to be higher. We ended up in Homebase where we found a Stewart essentials propagator. It doesn’t have a thermostat, but the instructions say that it should achieve a temperature of between 10-15 degrees centigrade above the ambient temperature. We have set up a max/min thermometer with a probe in the propagator to see what temperatures we achieve. We’ll let you know how we get on. In this video, we set up the propagator and sow some more seeds – including the pot black and rose bianca aubergines that Sandra won from Mr Fothergills. We had a lot of fun making this video. Be sure to check out the out-takes at the end of the Video! The Quest for Veg is an allotment diary of our adventures as we transform a neglected and overgrown plot into a productive growing space. Or try to!